Phenomenal poem. This can (and does) move mountains for me personally and many others. Religion is a very hard thing to get a grip on, but I do believe hurdles in life are there for a reason and we learn from all of our difficult times. I agree with both comments and think this is such a beautiful message. Society often blames religion for the cause of wars and conflicts thru out the world!Religion does not creates such,man in the quest greatness do.”Footprints In The Sand” wow whenever I feel like my knees get weak I read Foot Prints In The Sand.I have it on my laptop as a screen saver!God bless you all. I first read this statement when I was in high school. It hung on a plaque in by best friends house in the bathroom. It was a great spot as I was always alone and had a few quiet moments to read it every time I visited. As a result, I now have a small plaque in my bathroom. I can always tell when a guest had read it after they exit the bathroom. Their misty eyes give them away every time. I miss my best friend growing thin…Catherine wheel. Forgiveness is as sweet as a spoonful of sugar. To know God is to love him, yourself, and others. Jesus was the original hippie. This poem signifies the omnipresence of God in our lives. Without the strength of belief the world seems a very utilitarian place. Believe in the impossible, and all seems possible. It is with infinite wisdom that we are created all as one. “There is no use in trying,” said Alice; “one can’t believe impossible things.” “I dare say you haven’t had much practice,” said the Queen. “When I was your age, I always did it for half an hour a day. Why, sometimes I’ve believed as many as six impossible things before breakfast.” Lol. See, believe and you shall see the doorway rise before your feet and the archway bend to greet your friend and and all shall be complete. I always read this poem when I am down. Because I want to tell myself that God is always with me…..
Today he was carrying me! I’m not gay or bi or a lesbian. However, I am happy this page posted this remarkable poem. Why you are trying to hand me over to Russia is beyond me. The U.S. is going to have a field day with this. I have a bookmark with this poem on it and this is the best poem in the whole entire world. 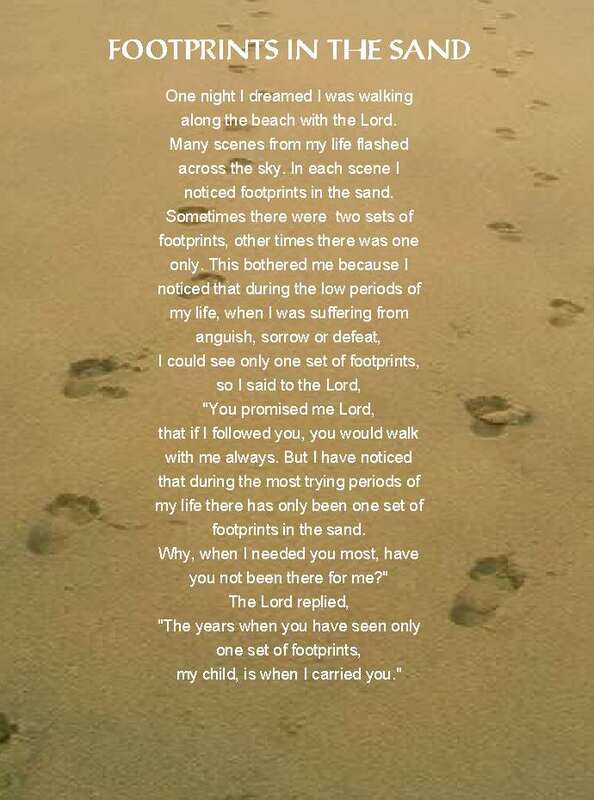 I LOVE Footprints in the Sand!!!! !